“Matrix is a perfect solution. A great-sounding console, ideal for those with a lot of outboard." 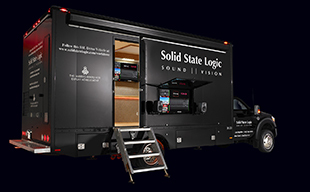 MAZOVIA, POLAND — Solid State Logic, the world’s leading manufacturer of creative tools for audio professionals, is proud to highlight one of the most comprehensive compact studios we have seen. In creating Ar-Ton Studio owner Artur Głębocki has combined an SSL Matrix mixing console with no less than twelve fully loaded X-Racks, two Mynx chassis’s and a full SSL Alpha-Link I/O system and an impressive collection of analogue hardware from other manufacturers to create a superb compact studio with 32 full channels of SSL analogue hardware at its heart. AR-TON is Artur’s vision of the best mixing and mastering facility in central Europe. With affordable rates that bely the quality level of the Aladdin’s cave of analogue hardware within, one thing is clear: with more than a little help from SSL, we think Artur Głębocki has succeeded in creating a leading candidate for the best-equipped compact mixing and mastering studio in Central Europe.